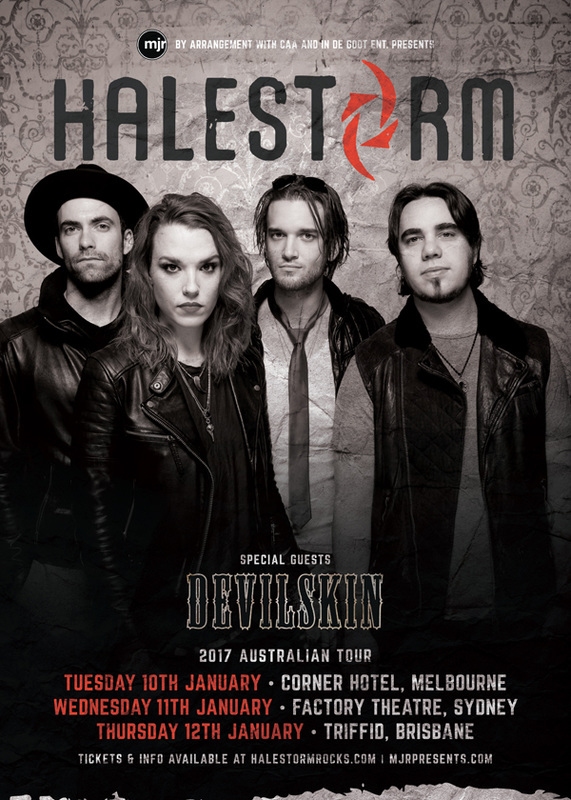 Halestorm, the Grammy-Award winning rock outfit from Red Lion, Pennsylvania in the USA, announce their Australian East Coast tour dates for January 2017 - and they are bringing their good friends Devilskin from New Zealand along for the party. The four-piece fronted by Lzzy Hale are returning for their second run of shows in Australia on the back of their 2014 release Into the Wild Life. The band were last here in 2015 and wowed audiences everywhere with their epic live show. Bringing along NZ Platinum Record selling heavy heroes Devilskin with their explosive live set was a no-brainer. Indeed, Freak Like Me and Love Bites (So Do I) both reached #1 on Active Rock charts in the US, making Halestorm the first ever female-fronted band to top the format’s airplay ranking. In addition, the band won a Grammy for Best Hard Rock/Metal Performance for Love Bites (So Do I). The accomplishments didn’t stop there. Hale collaborated with “America’s Got Talent” star Lindsey Stirling on the EDM song Shatter Me and performed with country maverick Eric Church at the CMT Awards, demonstrating her versatile vocals mix with any genre. On top of that, Hale was honoured by Gibson Guitars, which celebrated her accomplishments by creating a Lzzy Hale signature Explorer guitar. The band have toured with incredible artists such as Alter Bridge, Chevelle, Seether, Staind, Papa Roach, Trapt, Three Days Grace, Theory of a Deadman, Buckcherry, Disturbed, Shinedown, Avenged Sevenfold, Stone Sour, Hellyeah, Heaven & Hell, Evanescence, The Pretty Reckless, Starset, Sevendust and Bullet for My Valentine. There’s just no stopping the Halestorm. General public tickets on sale 9am on Friday 14th October.